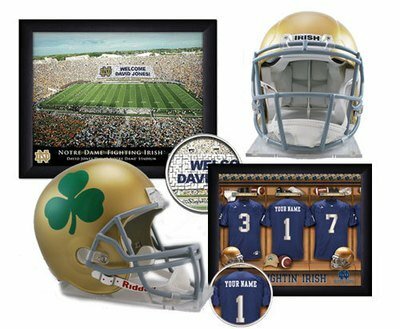 We want to apologize for the poor delivery of Blue & Gold Illustrated some of you are receiving. The magazine is completed by 10:00 a.m. on Sunday mornings and delivered electronically to its printer, The Papers in Milford, Ind. Our staff works into the wee hours of the night (especially on late games) and early Sunday mornings to meet that deadline. Blue & Gold Illustrated is printed, labeled and picked up by the post office around 3:00 p.m. and delivered to the South Bend post office that Sunday afternoon. The magazine has followed the same football season process and used the same printer for over 30 years. What has changed over that period is the U.S. Post Office and its financial situation. Congress has held it to a six-day-a-week delivery system while requiring it to be self-sufficient. That has proved impossible because of several factors. From 2007-2010 alone, the “USPS lost $20 billion, and its debt increased from $2.1 billion to $12 billion.” It has only increased since then. The USPS lost $5 billion in the 2013 fiscal year and $5.5 billion in the 2014 fiscal year. The USPS reached its legal $15 billion deficit ceiling back in 2012. One major reason: the USPS is legally bound by Congress to “prefund more than $5.5 billion annually for health benefits for future retirees,” since 2006. As of 2013, the USPS set aside about $44 billion for this specific allocation. Frankly, it’s something the USPS can’t afford. When the mandate was implemented in 2006, the USPS was financially strong. It was before the 2008 recession and explosion of other communication outlets. In 2012, it defaulted on this payment for this first time. That brings us to our second reason for the default: lower volume. In 2006, the USPS delivered 97 billion pieces of first-class mail. In 2012, it delivered 68 billion pieces. The decline isn’t surprising with today’s innovative technologies that are only expanding. Everything seems to be going online from bills to keeping in touch. Other factors include competition from FedEx/UPS, ballooned operating costs and the demands of the unionized workforce. In attempt to reduce costs and cut its deficit, projected at $5 billion for 2018, the U.S. Post Office has closed offices and loosened its delivery standards. The base price of Blue & Gold Illustrated includes delivery by periodical mail, the post office classification for newspapers and magazines. Once treated like first class mail, periodical mail now gets “expedient service when available,” which explains the wide difference in days that the magazine arrives. Over 4,900 of our 11,000-plus subscribers pay an extra $2.00 per issue to get first-class delivery during football season. The magazine comes to them in an envelope. While this does not guarantee delivery prior to the next game, it enhances your chances. Call us at 800-421-7751, and we can set this up for you for the remaining issues this season. 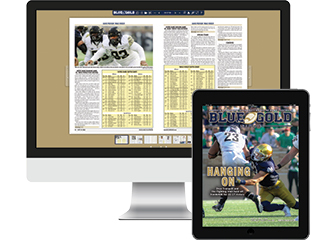 Each Sunday during football season, a digital copy of Blue & Gold is posted on BlueGoldOnline.com by 11:00 a.m. You can read the whole magazine on a computer, tablet or smartphone, including the extensive game coverage, before noon. The color is great, you can enlarge the type, it’s never torn or damaged, and, most importantly, it’s never late. Plus, every issue dating back to 2012 is available on the site. We started providing a digital issue of the magazine when our company bought Blue & Gold in May 2009 to offer a solution, at no extra cost, for the postal delivery issues some readers were experiencing. Today, over 2,000 subscribers take advantage of this service. We also send out a digital newsletter each Thursday with previews, rosters, depth charts and stats for the upcoming game. You can easily print out rosters for the weekend’s game. If you are not reading the digital edition and our weekly newsletter, we encourage you to give it a try. Send us your e-mail at bgisupport@BlueandGold.com and we’ll send you a notice when the magazine and newsletter are posted online. While we are in constant contact with the post office about delivery issues, first-class delivery and our digital version and weekly e-mail are the best options for reading Blue & Gold Illustrated and being prepared for the next game before it’s played.